This timeless halo ring is crafted from a unique blend of metals lending to its gorgeous rose-hue, set with radiant clear stones. The gorgeous blush tones of PANDORA Rose heighten its exquisite vintage expression. Available online or in concept stores. PANDORA Rose Classic Elegance Ring is rated 4.7 out of 5 by 33. 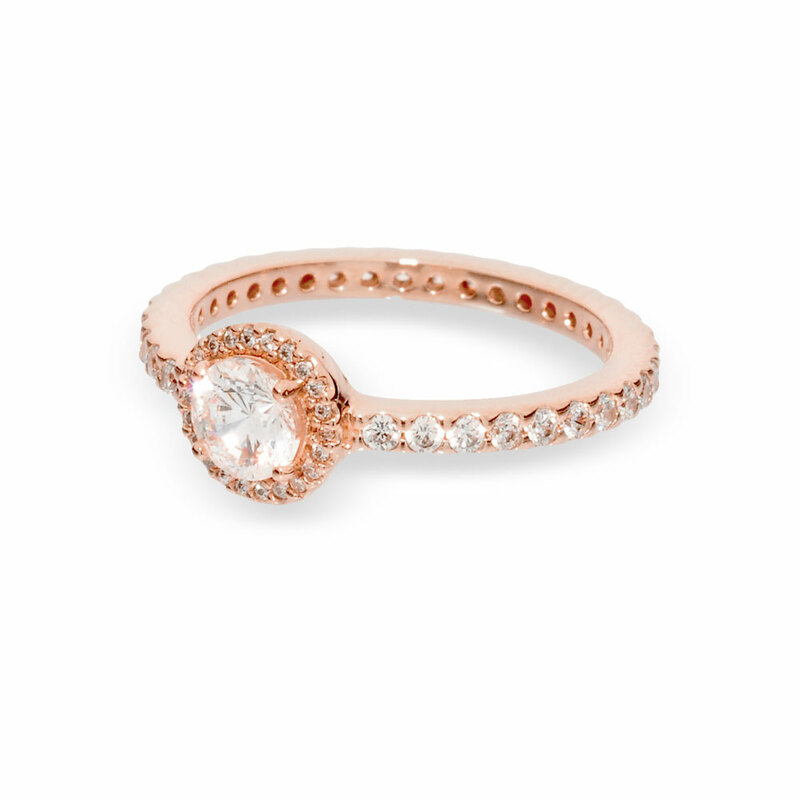 Rated 5 out of 5 by rosegold85 from I love this ring! I absolutely love this ring! It isn’t too big but it isn’t too small either. It is just absolutely stunning! Rated 5 out of 5 by JoshL18 from Best purchase ever! I purchased this ring as a gift for my beautiful girlfriend and she loved it! I definitely recommend this ring if you’re in need of an affordable gift. Rated 5 out of 5 by Jordannmat from Gorgeous ring About a year ago my boyfriend gave me a pandora ring as a promise ring. It was beautiful. Over the weekend he proposed with this ring and the picture does not even do it justice. I designed SO MANY rings online and none of them could have compared to this one. It was EXACTLY what I wanted and if the quality is anything like my other ring I know it will stand the test of time. Rated 5 out of 5 by Libbeylu from Love it! My grand daughter loved it ! It was a perfect fit. Rated 5 out of 5 by Emas from Stunning My boyfriend gave this to me as a promise ring & I love it! It’s not too big & not too small, just absolutely perfect & noticeable. I received so many compliments. Rated 4 out of 5 by KL04 from Great every day ring! Bought this ring to replace an every day ring I had worn for about 9 years. I think it’s great! It doesn’t shine as much as I thought it would, but it looks great with all my outfits. Rated 5 out of 5 by naaron07 from Amazing gift, amazing ring! My boyfriend got this for me on Valentine's Day which is also our anniversary! The color is astonishing, I LOVE rose gold!